Valentine Sevier is my seven times paternal great grandfather. The Sevier descent is as follows . . . But, as anyone should know about dancing with the ancestors, a simple descent is only part of the story. 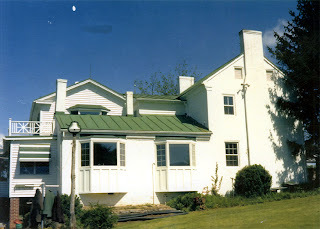 From what I have discovered - check out this site for more information: http://www.johnsevier.com/bio_valentineimmigrant.html - Valentine Sevier was born in London, England about 1711 or 1712. He immigrated to America in 1740 along with his brother William. Valentine Sevier married Joannah Goad (b. November 1, 1723 in North Farnham Parish, Richmond County, Virginia; died August 15, 1773 in Rockingham County, Virginia) daughter of John Goad and Catherine Jennings, sometime before 1745. After Joannah's death, he married a second time to Jemmima Young. John Sevier - born September 23, 1745 in Frederick County, Virginia; died September 24, 1815 at Fort Decatur in Tuckabatchie, AL. John was the first governor of Tennessee. Valentine Sevier II - born September 23, 1747 in Rockingham County, Virginia; died February 23, 1800 in Clarksville, Montgomery County, Tennessee. Robert Sevier - born about 1749 in Rockingham County, Virginia; died October 16, 1780 in Kings Mountain, Cleveland, North Carolina. Mary Polly Sevier - born about 1753 in Rockingham County, Virginia; died April 24, 1854 in Harrisonburg, Rockingham County, Virginia. Catherine Sevier - born about 1757 in Rockingham County, Virginia; died September 6, 1824 in Overton, Clay County, Tennessee. 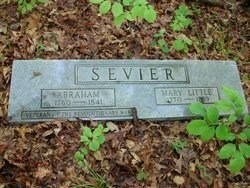 Bethenia Sevier - born 1759 in Shenandoah County, Virginia; died 1760. Abraham Sevier - born February 14, 1760 in Frederick, Shenandoah County, Virginia; died June 18, 1841 in Overton, Clay County, Tennessee. Elizabeth Sevier - born about 1762 in Rockingham County, Virginia; died February 1, 1839 in Bledsoe County, Tennessee. The part to the left is add-ons throughout the years. Abraham Sevier married Mary Little (born May 14, 1770 in Augusta County, Virginia; died March 14, 1839 in Pickett County, Tennessee), daughter of Major General Little and Mary Ann Pearson, on 1784. They had the following children . . .
Elizabeth Sevier - born November 12, 1790 in Carter County, Tennessee; died November 21, 1805 in Carter County, Tennessee. Mary Ann Sevier - born December 9, 1792 in Carter County, Tennessee; died after 1850 in White County, Tennessee. John Sevier - born January 13, 1795 in Carter County, Tennessee; died September 2, 1795 in Carter County, Tennessee. Jemima Douglass Sevier - born August 27, 1796 in Carter County, Tennessee; died July 3, 1822 in Carter County, Tennessee. Joanna Goode Sevier - born April 13, 1799 in Carter County, Tennessee; died December 29, 1836 unknown. Valentine Smith Sevier - born November 20, 1801 in Carter County, Tennessee; died January 25, 1842 in Morgan County, Illinois. Rebecca Richards Sevier - born October 20, 1804 in Carter County, Tennessee; died July 6, 1822 unknown. Abraham Rutherford Sevier - born January 17, 1807 in Livingston, Overton County, Tennessee; died February 19, 1870 in Clinton, Henry County, Missouri. Catherine Sherrill Sevier - born Mary 17, 1809 in Carter County, Tennessee; died September 18, 1861 in Osage County, Missouri. Robert Barnett Sevier - born April 9, 1812 in Overton County, Tennessee; died June 12, 1828 unknown. It appears Abraham and Mary liked to name their children after people they knew. Jemima Douglass appears to be named after Abraham's step-mother and Catherine Sherrill appears to have been named after his brother John's wife. Mary Ann Sevier married John Halterman (born about 1791 in Virginia; died about 1850 in White County, Tennessee) on November 20, 1830 in White County, Tennessee. They had the following children . 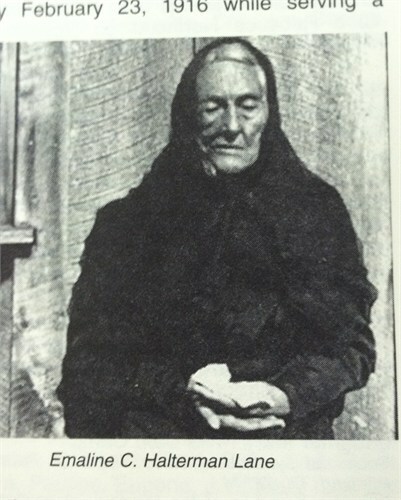 . .
Mary Halterman - born about 1815 in White County, Tennessee; died unknown. Melvert Halterman (twin) - born April 19, 1817 in White/Warren County, Tennessee; died before 1870 in Warren County, Tennessee. Melvina Halterman (twin) - born April 18, 1817 in White/Warren County, Tennessee; died December 7, 1880 in White County, Tennessee. 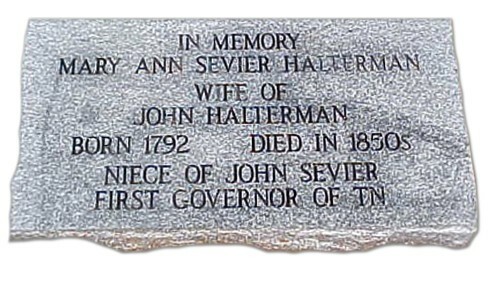 John Sevier Halterman - born November 6, 1819 in White/Warren County, Tennessee; died June 4, 1890 in White County, Tennessee. Elizabeth Halterman - born about 1825 in White/Warren County, Tennessee; died July 1860 in Tennessee. Jesse Marion Halterman - born December 21, 1828 in White County, Tennessee; died March 3, 1874 in Ballard County, Kentucky. Adaline Halterman (twin) - born July 26, 1836 in White/Warren County, Tennessee; died after 1910 in Knox County, Tennessee. Emaline Halterman (twin) - born July 26, 1836 in White/Warren County, Tennessee; died August 5, 1923 in Warren County, Tennessee. Note: five of the Halterman children, married five of the children of Endymon Baker Lane and his wife Jane Campbell: Mary married David Campbell Lane, Melvert married Eliza Julia Lane, Elizabeth married Richard Brooks Lane, Adaline married Charles Patrick Lane, and Emaline married Hardin Smith Lane. Emaline Halterman married Hardin Smith Lane (born March 26, 1833 in Van Buren County, Tennessee; died December 31, 1862 during the Civil War at the Battle of Murphreesboro in Murphreesboro, Tennessee), son of Endymon Baker Lane and Jane Campbell, on December 30, 1855 in Warren County, Tennessee. They had the following children . . .
Mary Lane - born about 1857 in Warren County, Tennessee; died February 12, 1945 in Huntsville, Madison County, Alabama. Martha Ann Lane - born August 22, 1858 in Warren County, Tennessee; died May 16, 1945 in Nashville, Davidson County, Tennessee. Franklin Pierce Lane - born October 10, 1860 in Warren County, Tennessee; died November 6, 1932 in Warren County, Tennessee. Hardin Smith Lane II - born March 1862 (his mother was pregnant when his father went off to war); died January 4, 1949 in Muleshoe, Bailey County, Texas. Some Events in Emaline's Halterman's life . 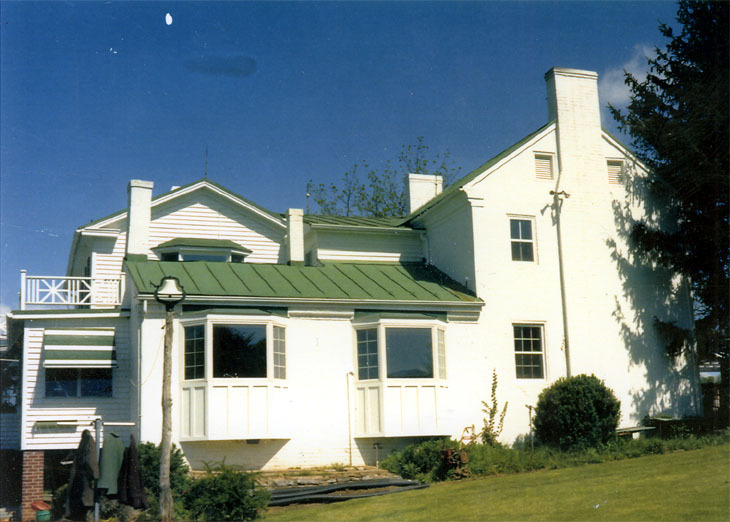 . .
1850 - still living with parents and her siblings Elizabeth, Abraham, and Adaline. 1870 - according to Warren County Census Records living with her four children Mary, Martha, Frank, and Hardin. 1900 - according to Warren County Census Records living with her son Frank, his wife Sallie, and their children Oliver, Soloman, John, Evan, and William. 1910 - according to the Warren County Census Records, living with her daughter Mary Halterman-Winnett and Francis Winnet. 1920 - according to Warren County Census Records, living with her daughter and son-in-law, Mary Halterman-Winnett and Frank Winnett. Variant Spellings of Halterman = Hotlman, Hatterman, Halterman, Holtzman, among other variations. Always fun when dancing with the ancestors. Martha Ann Lane married John Leonard Smith (born August 16, 1849 in Warren County, Tennessee; died January 14, 1917 in Nashville, Davidson County, Tennessee), son of John B. Smith and Rebecca Adcock, on September 24, 1882. She was John's second wife. His first wife was Irena Gribble, by who John had seven children: Lucy, John B (died young), Mollie, Francis Ida, M. J. (died young), Euphemia, and Herman (died young). Martha Ann and John Leonard had the following children . . .
Olive Mae Smith - born December 28, 1884 in McMinnville, Warren County, Tennessee; died November 23, 1935 in Davidson County, Tennessee. Octavia Smith - born April 12, 1887 in McMinnville, Warren County, Tennessee; died March 1984 in Hendersonville, Sumner County, Tennessee. Eunice Irene Smith - born February 20, 1889 in McMinnville, Warren County, Tennessee; died August 19, 1890 in McMinnville, Warren County, Tennessee. 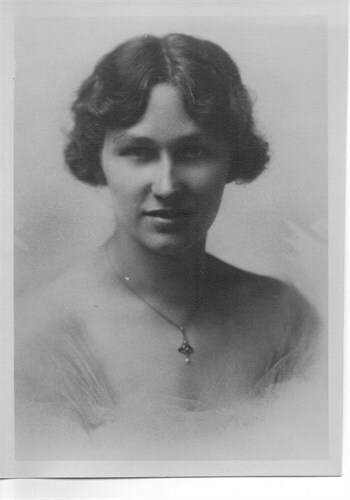 Osie Lee Smith - born December 9, 1894; died November 23, 1976 in Hendersonville, Sumner County, Tennessee. Clara Smith - born February 28, 1898 in Tennessee; died March 1968 in Nashville, Davidson County, Tennessee. Death Certificate: for whatever reason, my great Aunt Clara, when providing the information on her mother's death certificate, listed Martha's mother as Emaline Holtman (see variations listed above) and her father as Franklin Pierce Lane, who was actually Martha's brother. I don't know why, can't ask her, but know for a fact that Franklin was not Martha's father. Osie Lee Smith married John Francis Mitchell (born November 3, 1884 in Warren County, Tennessee; died May 27, 1959 in Nashville, Davidson County, Tennessee), son of Charles A. Mitchell and Martha Ann Tate, on June 25, 1913 in Nashville, Ward 10, Davidson County, Tennessee. They had the following children . . .
Mary Frances Mitchell - born April 29, 1914 in Nashville, Davidson County, Tennessee; died August 23, 1996 in Hendersonville, Sumner County, Tennessee. Vernon Smith Mitchell - born January 21, 1916 in Nashville, Davidson County, Tennessee; died September 10, 2004 in Crossville, Cumberland County, Tennessee. Mary Frances married and had two children, and five grandchildren. 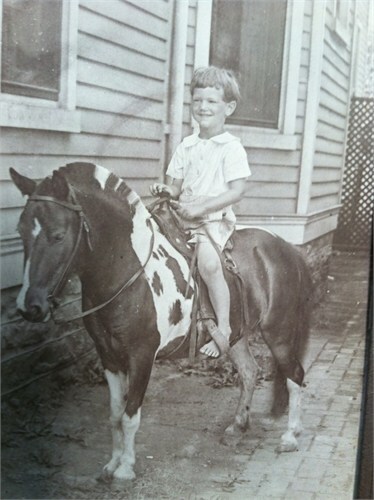 Vernon married had had four children and five grandchildren. And here ends the Sevier descent of the paternal side of my family tree. Okay, not really, but the rest of the descendants are living, so their information doesn't become public record.